Life is perilous for young ant queens. This fire ant (Solenopsis invicta) is being pursued by native Forelius ants after her mating flight in central Florida. She frantically climbs a grass blade to escape, but to no avail- the attackers follow. She will make an excellent source of protein to feed the Forelius larvae. Two larger points about this photo. First, establishing new colonies is tremendously difficult. The founding stage is when most colony-level mortality happens, and this excessive mortality is why ant nests produce hundreds of queens every year in the hopes that a handful survive. 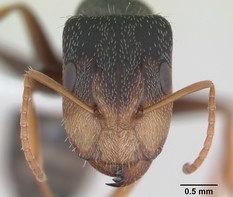 Second, native ants may be our best friends in combating the spread of introduced pest ants. Healthy, intact native habitats with thriving local ant populations make it more difficult for intruders like the fire ant to gain a toe-hold. The more we alter habitat and the more we use generalized pesticides, the more problems we cause our native species and the easier it is for pests to establish. Does ant activity cycle by an internal clock, or is their activity cycle a response to changing environmental cues? A study in Insectes Sociaux weighs in on the side of environment. Penick & Tschinkel experimented with applying light and heat from different directions and at different times of day to fire ant mounds. It turns out that the ants’ daily rhythm of moving their brood around the nest is a result of temperature tracking. I’ve pasted a link to the article and the abstract below.